Male Mahadeshwara Hills is situated about 150 km from Mysore and is a sacred place, with its famous Shiva temple. Mahadeswara, as lord Shiva is called in this place, is a deity worshipped by one and all in the surrounding places. Amidst dense forest, the temple attracts not only the pilgrims but also nature lovers. 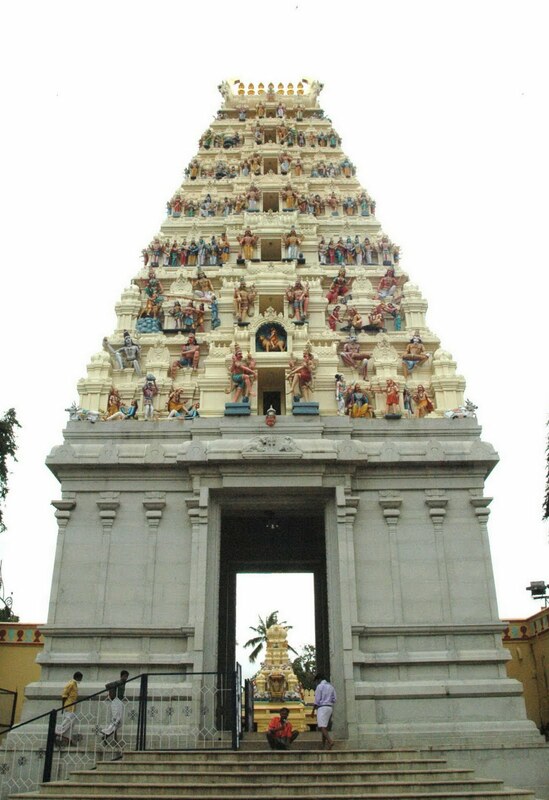 The ancient and sacred temple of Sri Male Mahadeshwara is located in South end of Karnataka state, in the Chamaraja Nagar District. It is a very popular & holy ancient temple, surrounded by 77 hills in the Eastern Ghats. The Lord Sri Mahadeshwara is believed to be the incarnation of Lord Shiva. It is a very famous Shaiva piligrim centre. The Lord Sri Mahadeshwara's miracles are beautifully sung by the village folk in Janapada (folk) Style. The height of the hill is about 930 m(3000 feet)above the sea level. Mahadeshwara is the family god of the hill tribals Soligas, Jenu Kurubas, Kadu Kurubas and also Kuruba Gowdas of Mysore and Chamarajnagar districts.. But, historical evidences suggest that saint Mahadeshwara must have lived during the 15th century. Further, he was the third head of the Haradanahalli Math.[. About 600 years ago, Sri Mahadeshwara Swamy came here to perform penance and it is believed that he is still performing penance in the temple's Garbha Gudi in the form of Linga. The Linga, worshipped now in the Garbha Gudi, is a self developed (Swayambhu) one. Sri Male Mahadeshwara Swamy was moving on a tiger known as Huli Vahana (Tiger as a vehicle) and performed a number of miracles around the hills to save the people and saints living there. The area of the temple surroundings is 155.57 acres. In addition, the temple has lands at Talabetta, Haleyuru & Indiganatha Villages. 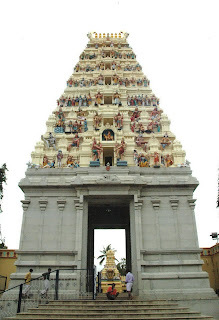 The temple was built by a rich Kuruba landlord called Junje Gowda. Ughe Anni Malaya Mahadeshwaranige, Ughe Anni huli govugala kataluva jaga dodayanige. Ughe, Ughe. Lord Male Mahadeshwara was born in the Kaliyuga. He chose his mother as Uttrajamma. He learnt in Saluru Mutt at Male Mahadeshwara Hills. He has many legends which could are narrated on his name. To name one of them is Sankamma Kate. This narrates about the devotion she had on the Lord. Male Madheshwara narrates the adventures and achievements of a spiritual hero of the Shaiva people of southern Karnataka. Probably he lived in the 14th century. According to the story Mahadeshwara was born to a fair coloured virgin woman. Shiva incarnates himself on earth as Mahadeshwara to destroy an evil king called Shravanasura. A pilgrimage to Malai Mahadeswara temple also includes a holy dip in the "antaragange", a stream flowing from a perennial source. Poojas at the TempleApart from being a pilgrimage, M.M.Hills possesses natural beauty in the form of large tracts of forest area. The beautiful landscapes of hills and valleys are covered with extensive forests. These forest types vary from evergreen forests in Ponnachi Boli to Dry deciduous forests in most other parts. M.M.Hills is bound by river Kaveri to the north-east and by river Palar to the south. Thus, it forms an extremely important catchment area for both these rivers. Rudrabhisheka: 6.00 am to 8.00 am and 10.30 to 12 noon. Archana: 6.30 pm and 8.00 pm. Sankashta Chathurti Poojas are performed on New Moon and Full Moon day of every month. Deepavali and Maha Shivaratri are very famous here. Trek to Palar from M M Hills is famous and takes about 2 days. One has to trek to Nagamale (1000m) via Indignata (874m), a hill which has a huge rock split into two portions which resembles a Linga guarded by a snake. 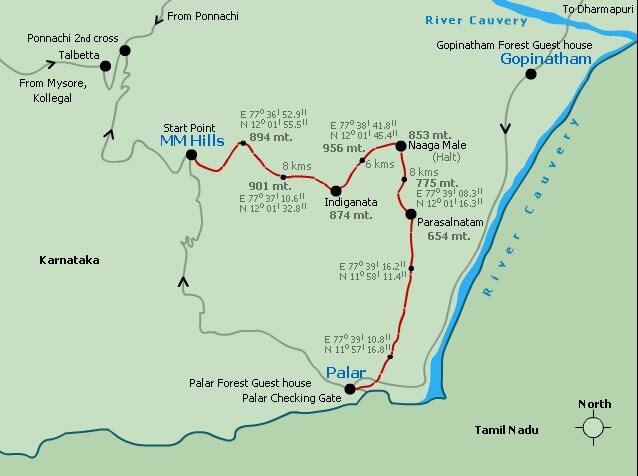 On the next day the trek will begin from Nagamale to the Parasalnatham (654 m) then Palar. This route has scenic view and one can enjoy the nature bounty. One has to carry food and water. The villagers in the area are helpful but there is no electricity at Indignatha. The first day will be more rigorous and tough. Beware of wild animals and take necessary precautions. MM Hills has food facilities. The MM Hills has been on the map for sandalwood smuggling, elephants poaching. Veerapan, a dreaded smuggler, was shot dead here. Trek-in-brief: This is a difficult but very rewarding two day trek. 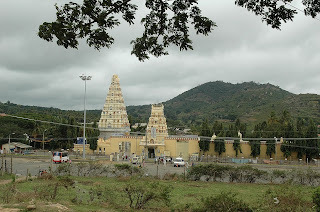 An important pilgrimage place - Male Mahadeshwara Hills is the start point. You go through beautiful and mythically mentioned landscapes. You will pass through the lands where the legendary bandit Veerappan had hideouts at various points. The first day's stop will be at Naagamale. 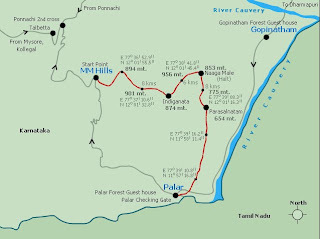 Second day you will start trekking towards Palar on the beautiful paths endowed with ample beauty of nature. Look forward to staying with the warm and loving people of the forest on your night halt at Naagamale. This may open up a few more perspectives towards living. Day two: Destination Palar. Start from Naagamale at 8:30AM. Six hours of trekking to Palar. Number of night halts: One night at Naagamale. If needed extra night halt at Palar. Facilities: Your first night halt is at Naagamale. There are no guest houses or camp sites at Naagamale. Here you have to stay with the hospitable locals. This is part of the local people development initiatives of the forest department. Please check the links above for the route map and tariff. Also, check the photo gallery for this route. Important note: Please ensure that you do read the guidelines and be prepared accordingly if you have got a route booked. We insist on following certain norms which have to be imposed upon one and all due to the nature of our work. Great post!! thanks for this lovely post in this blog. Well written up. Loved reading this blog. Very useful information in this blog. Visit those places in Parveen Travels and enjoy your trip.